We were extremely careful in choosing a cloud service provider that could help us grow our global businesses. One of our key considerations was whether the service provider had superior cloud technologies and could offer sophisticated, proven, and uniform services worldwide. AWS hits a home run on all these points, enabling us to better run our global enterprise-level business applications and accelerate our digital transformation. EF, known worldwide for its English-language lessons, is a private company specializing in language learning, educational travel, and academic degree programs. EF has brought English training to every corner of the world and is growing rapidly worldwide thanks to its fully digitalized support platforms, innovative learning systems, highly integrated and customized teaching materials, strong foreign teaching staff (who hold international certificates of qualification), modernized English learning environment with convenient locations, as well as overseas learning opportunities. In 2016, EF became the official language training supplier of the Rio Olympics. Globalization has highlighted the importance of English language education. Since its founding in Lund, Sweden in 1965, EF has built a name for itself in the industry, expanding its businesses to 116 countries and regions and boosting 46,500 employees across North America, South America, Europe, and Greater China. To support a business of this scale, EF’s IT division developed an elaborate core business application system that has been in use since the early years of the company. This system comprised a number of modules covering customer relationship management, school operation and management, resource and planning management, business intelligence platform, media applications, sales management, and digital content management, etc., designed variously for the management, front-line sales staff, teachers, and academies. As robust as this system was, with the meteoric rise of internet technologies and online education in recent years, EF’s IT team started to face mounting challenges in both maintaining the internal IT system and responding swiftly to the changing needs of business teams and students. EF realized that IT was no longer only about maintaining and supporting various internal and external infrastructures, hardware and software, rather, it should enable the IT division and business division to work more closely together to tap deep into the innovative power and potentials of digital platforms. For example, it should allow the business team and IT team to co-develop a wider range of online learning products and mobile applications to improve the learning efficiency of students. After EF made its strategic decision to migrate from on-premises data centers to the cloud, the first thing it needed to consider was how to choose a cloud service provider that could support multiple business regions and worldwide growth. “We had to be cautious in choosing a cloud service provider that could best support our global business. One of our main considerations was whether the service provider had a unified platform internationally, superior cloud technologies, and the ability to deliver sophisticated, proven services,” says Tsui. To make that choice, EF carefully compared the mainstream cloud service providers on the market, assessing their stability, maturity, flexibility, and technical support in view of its own service offerings and its needs and usage scenarios in various countries and regions. Through this comprehensive assessment process, in-depth discussion of technical and financial details, and proof-of-concept testing, EF finally settled on Amazon Web Services.EF believes that AWS is a perfect match for its needs, as the latter’s 44 Availability Zones in 16 geographical regions around the world would allow EF’s IT team to run enterprise business applications from the cloud with higher availability levels. More important, AWS also fully aligns with EF’s goal of achieving serverless computing. With AWS’ quality cloud services, EF can continue to develop innovative products based on big data, artificial intelligence, and machine learning, without needing additional hardware investments for these new technologies. In 2016, EF began to gradually migrate its core business applications – customer relationship management system, school operation and management system, resource and planning management system, business intelligence platform, media applications, sales management, and digital content management – from on-premises data centers to the AWS cloud platform. Given the ease with which AWS can be used and managed, EF’s IT team became technically proficient in performing the cloud migration after a brief training, and was able to rapidly build the company’s IT environment on AWS. For the migration, the team used AWS CloudFormation to create resources on the cloud in a fast, organized manner; architecture of the target resources can also be defined and adjusted when and as required during the migration process. It didn’t take EF long to complete its first migration project, and its North American data center was also successfully migrated to the AWS Singapore Region and AWS Tokyo Region. And in China, EF chose to migrate all its business applications previously hosted in Shanghai data center to AWS Beijing Region operated by Sinnet. EF hoped that by making the most out of the superior networks of these key cities, users around the world could enjoy efficient, low-latency access to its core business applications. 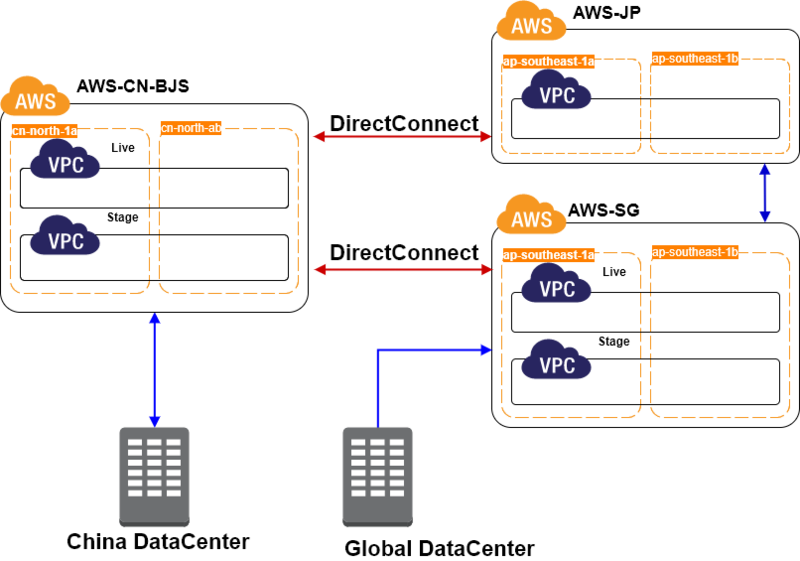 With the help of technical teams from AWS and the AWS Partner Network, EF achieved interconnection between its AWS regions and its Amazon Virtual Private Cloud (Amazon VPC) networks using AWS Direct Connect, enabling efficient data synchronization as well as remote disaster recovery for core business application data. Figure 1 illustrates EF’s system architecture. For EF, successfully migrating its original core business system to AWS has paved the way for an easier, faster digital transformation of its entire education business. The rich selection of PaaS services from AWS, such as the Amazon Relational Database Service (Amazon RDS) which supports multiple database engines, allows EF to rapidly develop and optimize products tailored for internet-based English lessons, shortening their lead times. Furthermore, these PaaS also empower EF to create more real-time interactive educational applications. For instance, AWS digital media solutions can be used to store and distribute courseware for the English lessons, allowing students to access them live or on demand via apps or web browsers. EF believes that education will gravitate toward personal attention and individualized teaching. Committed to delivering a great English learning experience to each and every student, EF has made big data and artificial intelligence two important focuses of its digital transformation. The company will build its own big data platform using the NoSQL database service from DynamoDB and Amazon Redshift data warehouses, perform deep analytics with AWS Machine Learning, and take advantage of the innovative AI technologies from AWS to provide better services to its employees and students as well as a next-generation, personalized English learning experience that enables greater learning efficiency. To learn more about how AWS can help you build serverless applications, please visit our Serverless Computing details page.